This prototype intelligent t-shirt that monitors temperature, heart rate and other body functions, while also locating the patients within the hospital and relaying their activity levels. The device is a part of LOBIN, a project concerning locating and biomonitoring of patients within the hospital by means of wireless networks. 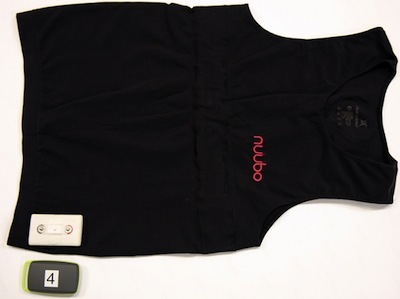 The t-shirt is washable and includes electrodes that detect bioelectric power through which an electrocardiogram can be obtained (“e-textile”). In addition, it has a removable device that includes a thermometer and an accelerometer, which are used to take the patient’s temperature, his relative position (reclining, standing, etc.) and his level of physical activity. A wireless network installed in the hospital is used for indoor localization and acquiring information collected by the sensors. SF fans may recall Rudy Rucker's heartshirt from his 1988 novel Wetware.